A Merkur 180 fully assembled. A few months ago(August) I was browsing Amazon’s manual shaving top seller’s category. I’m a little bit of a shaving geek and was curious to see what was popular. The top spots were held by replacement cartridges for the Fusion Proglide and Mach 3 razors. I was kind of shocked to see that a safety razor, the Merkur 180 to be exact, was sitting in the #4 top-seller in the manual shaving category. I’ve never had any experience shaving with safety razors, also known as double-edged(DE) razors. I’ve shaved with straight razors, shavettes, and feather razors before but never a safety razor, so I figured I would give it try. I ordered the Merkur 180 long handled safety razor along with a 100-count pack of Astra safety razor blades. It took me a few months to shave with it, but last night I finally used it to shave 3 weeks of beard growth off. Initially, it took me a few strokes to learn the correct position to hold the handle. After I learned the correct way to hold it, the razor did a pretty good job shaving my beard off. Having the two sides of the razor to shave with makes shaving easier since you can shave with both edges and then rinse them off at the same time. About halfway through shaving the right side of my face I started having a little difficulty. 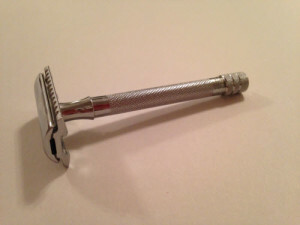 The Merkur 180 safety razor comes with a guard. This guard helps you to not cut up your face as much, but at the same time it can cause longer hair to get clogged between the guard and the blade. I’m sure if you are only shaving a few days of stubble this is not going to be an issue and the stubble is going to wash right out, but since I was shaving three weeks of growth the hair was long enough to get clogged. This actually caused me to get a little annoyed with it. I had expected the Merkur 180 to perform a little bit better and not to get clogged. To add to my annoyance just rinsing the razor under the sink wasn’t removing the hair. At this point I realized that all I had to do was to loosen the head a little bit and then rinse under water. After I loosened the head of the razor a little bit, this allowed for more clearance for the water to wash the hair out and I was able to tighten it back up and resume my shave. The rest of my shave went pretty smooth. I gradually learned the angle I needed to hold the blade at to effectively shave the hair. I only nicked myself once about a quarter inch away from the edge of my lip where my upper lip and lower lip meets. This I attribute to carelessness more than anything else. After finishing a pass going with the grain(WTG), I decided to lather up and do a second pass going against the grain(ATG). It seemed a lot easier to get the right angle to shave against the grain than it did going with the grain. When I was finished with my shave, I was pretty satisfied with it. I hadn’t gotten a completely smooth shave on all areas of my face. I would say there was about 25% of my face where I could still feel some stubble if I rubbed my face against the grain. However, I was satisfied with this since it was my first shave and also because I wasn’t trying to get a super close shave. I was just shaving with it to see how it handled. Simple and intuitive assembly. All you have to do is unscrew the head from the body, insert the blade between the guard and the top, and then screw it back onto the handle. Clogged less than a typical cartridge razor. I think the razor handled my 3 week beard a lot better than a fusion proglide or mach 3 ever would. While it did clog at one point in my shave all I had to do was loosen the head up a little bit, rinse the hair out and then tighten it up. This is a lot easier than trying to rinse a clogged multi-blade cartridge razor. Blades are cheap. I bought a 100-count pack of Astra blades for $11.99, so the average cost per blade is twelve cents. If you want to shave with a new blade each day it would run you about $3.60 for a month of shaving. That’s around the same price for a mach 3 or fusion proglide, if you believe that they will last a month. 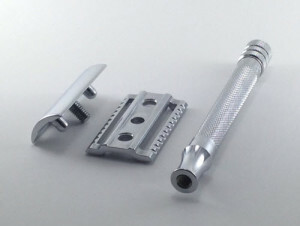 If you use the blades for two shaves before throwing them out, then you are already saving over half of what you would be paying for cartridge razors. It has a guard. The Merkur 180 has a guard that helps protect you against nicking yourself. It is still possible to nick yourself as I proved with my first shave, but I feel the guard greatly cuts down on the amount of nicks you will get. Learning the angle of the blade. 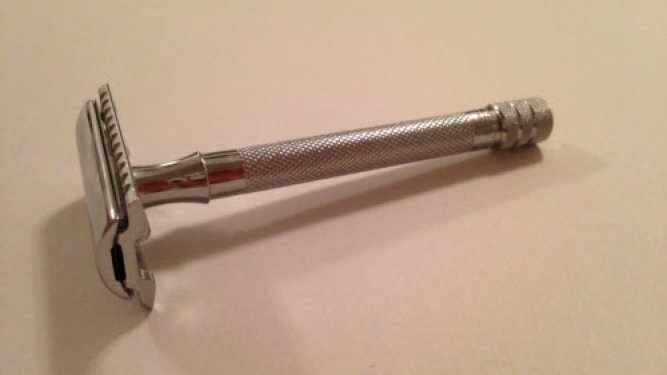 I didn’t think it would be very hard for me to learn the angle to shave with since I had experience with straight razors and shavettes, but a safety razor is a completely different beast. You will have to play around to find the correct angle, but it’s not that hard. You are stuck with the same angle. 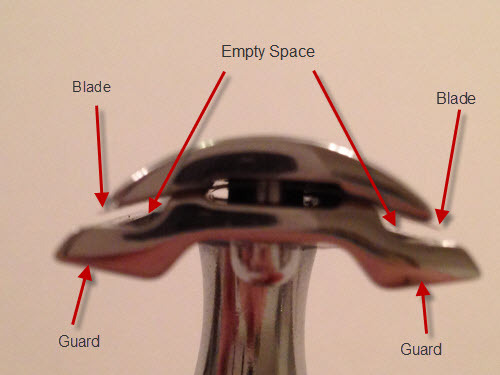 I’ve seen other safety razors where there was a little dial that allowed you to control the angle of the blade. The Merkur 180 doesn’t have this dial, so you aren’t able to control the “aggressiveness” of the razor. Hard to get under the nose. The rounded top of the Merkur 180 is pretty bulky and I found that it made shaving the hairs right under my nose tricky. Overall, I had a great experience with the Merkur 180. I can see why a lot of people choose to shave with a safety razor. You get a similar feel of a cartridge razor, but without the cost. You also get the close shave of a straight razor without the maintenance of one. I would definitely recommend it if you are looking for a great shave, to save money, or both.